Barron: “Zero Project” is something I'm working on as a radio broadcast journalist. I have been researching the discovery of zero. But the important thing to start with is the question that most people would ask: What is it that is so important about zero? Haven’t we always had a zero? So the very concept of zero did not always exist. And only after the concept developed into its use as a numeral was it possible for the decimal system to be developed, was it possible for calculations. It made it possible to multiply and divide. It made mathematics and calculus possible and those things made our modern world possible. VOA: Okay, so we know the number zero is important. What is your project all about? Barron: It's all about who discovered zero. In schools today throughout America and Europe — and worldwide for that matter — we are taught that our number system is called the Hindu-Arabic system. It was widely thought that Arabian traders in the Middle East developed the numeral system we use today. And it was also thought that the numerals that we use today originated in India as a part of the Hindu and Buddhist religions. But it turns out that that isn’t necessarily true. The BBC, as late as 2008, produced a groundbreaking documentary television series about the history of math. And in that series, they proclaimed — absolutely, positively — that zero was invented in India. And as proof of that they showed a stone tablet, a carving on a stone wall, in India. And it had what everybody in the world thought was the very first written record of a numeral zero. That tablet and that inscription was dated at 876 A.D. Archaeologists and scientists said, “This is proof, this is the first record of any culture anywhere in the world using the numeral zero.” But was it true? I don't think so. The fact is there was a French archaeologist who discovered a stone tablet bearing a date that was carved and dated at almost two hundred years earlier. And where was it found? It was found in Cambodia, in a temple along the Mekong River, in 1893. But it was ignored — nobody really paid much attention to it. Then it was translated and recorded by another French archaeologist in 1929. But the stone was lost. 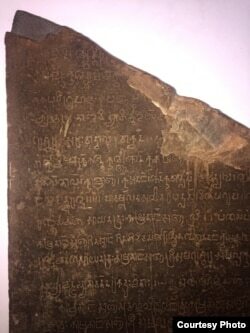 It was stored at a museum in Phnom Penh temporarily, but nobody paid any attention to it. Then, in 1975, it disappeared again following the occupation of Cambodia by the Khmer Rouge. The Khmer Rouge were known to loot and destroy archaeological artifacts, and the stone was feared to be lost. There were no photographs of it, so there was no proof that the number zero first appeared in Cambodia. [Later], the mathematician Amir Aczel decided he would make it his passion to try to find that stone. He ultimately was able to track it down to a shed that the public is not allowed into, in Siem Reap near Angkor Wat. He found it and he rejoiced — he took pictures of it. It is now on display at the National Museum, and it is the oldest known record of the use of zero in the world. ​VOA: So the stone is in a museum. What’s next? But right now, the reason zero is important to the Khmer people is because it can legitimately, honestly be a source of pride. [Cambodia] is the first place in the world that used the number zero. ​Barron: A couple of things. First, you have to ask yourself: Where did the zero come from? Was it an invention of the Cambodian people? Or could it have come to Cambodia from India? In Southeast Asia and in Cambodia, the Hindu religion and the Buddhist religion were brought to the areas by the Indians. They came overland through the north and west, through what used to be Burma, and they came through the ocean near Java, brought by the trade winds, and they were traders. And because they were Hindu Indians, they influenced the pre-Angkorian Khmer people in the second and third centuries. So one could ask: Did the Hindus bring zero to Cambodia, or did the Cambodians invent zero and give it to the Hindus, who took it back to India? It’s also true that there is a great deal of evidence that the Indians were quite advanced in their concept of the number zero, the concept of the idea of zero, in part because the Hindu and Buddhist faiths embraced the idea of nothingness. And it’s always possible that two cultures could develop the same concept at roughly the same time. It’s also possible that new artifacts will be uncovered by archeologists in the future, which will tell us something entirely new. But right now, the reason zero is important to the Khmer people is because it can legitimately, honestly be a source of pride. [Cambodia] is the first place in the world that used the number zero. VOA: What are you working on right now? ​Barron: I’ve done this research so that I can produce a radio feature telling the story and letting people know about these discoveries. In 2008, the BBC was reporting authoritatively that zero was invented in India. And they used the tablet there as proof. But now we know the first example was in Cambodia. The story does need to be told, and I hope to tell it. I hope to be able to produce, by early next year, a feature story that explains this discovery of zero, the importance of zero and why the Cambodian people can be so very proud. VOA: What would you tell Cambodians about this discovery? Barron: The Khmer people are ingenious people. They were in the forefront of the use of numerals in mathematics. They have much to be proud about — the innovations of their culture. It was only two or three hundred years after the tablet containing the example of zero was carved in Cambodia that the great Angkorian civilization arose. Most Cambodians don't know that their country was home to the largest city in the world at that time. The city surrounding Angkor Wat was a city of elaborate canal systems, elevated roadways, suburbs, commercial centers, centers for worship, and it housed nearly a million people. At that time, London had 30,000 people and Angkor Wat had nearly a million! And the size of Angkor is amazing. Angkor is larger than the city of Los Angeles today. It’s that big. It seems to me that many Khmer people, especially younger Khmer people, simply do not understand the magnificence of their culture, and the contributions their culture has made to the world. It’s a little-known secret. There needs to be a renewed pride in a wonderful culture that has made some of the most fantastic buildings in the world. VOA: If it is proven that zero was indeed invented in Cambodia, what would that mean for the country? Today in Cambodia there are still so many tensions some say it’s spiraling down into tyranny again. And the Cambodian people need something — and have something here — to be very, very proud of. ​Barron: The question of who invented zero first is a matter of debate among the world’s greatest archaeologists and historians. If we could say absolutely that it was invented in Cambodia — and we nearly can — I would say simply that it’s an example of a culture that existed thousands of year ago that has made a mark on today’s world of science and technology. That is something enormously important to any culture. Today in Cambodia there are still so many tensions ‑ some say it’s spiraling down into tyranny again. And the Cambodian people need something — and have something here — to be very, very proud of.